Demolition is much more than knocking a wall down with a sledge hammer. 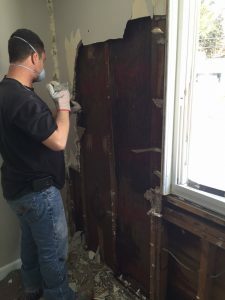 From minor demolition, such as taking out a wall or doorway, to leveling an entire structure, it takes a lot of skill and experience to safely complete a residential or commercial demolition project. Here are a few safety precautions you should keep in mind. This is the biggest tip, as it may save you from future problems with your demo project. A foreman and crew that know what they are doing and have the proper skills to operate the equipment needed should be able to foresee and avoid possible problems. Before any demolition happens, it is critical to clear the building of people, and make sure to disconnect any electric cables that might produce an electrocution or fire risk. Beginning residential or commercial demolition on a lower floor is like trying to take the bottom can from a stack in the supermarket; a disaster in the making. To prevent collapse, always start at the highest point and work downward. Gathered piles of debris could cause a serious weight hazard to the floor below and create a risk of collapse. To avoid this, be sure that debris is carefully cleared away to avoid overloading a level. If someone must go into the structure while demolition is ongoing, it is imperative to brace the ceilings and walkways to keep it safe. Everyone working on the demolition project should wear the correct safety gear, including a mask, gloves, boots. Residential and commercial demolition can carry huge risks if you’re unexperienced and unprepared. But those risks go down when you have skill and knowledge of a good demo team and know what to keep an eye out for.